So you have a house guest for breakfast and you want to impress the pants off them (literally or otherwise)? Or you’d like to spoil that special someone whose already in your life? Fancy a break while you cook the kids breaky? 7. Crack in two eggs. 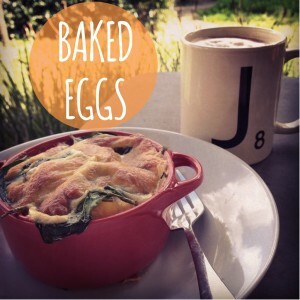 Jiggle the ramekin to get the egg white down. 10. Serve in or out of ramekin. I like to run a knife around the edge of the ramekin and tip the egg onto a plate. To add some protection to your eggs (that oven is hot) you can pop a layer of baby spinach on top (between the eggs and the cheese). This seals in the ramekin and semi-poaches the eggs. The beauty is that whatever you have in the fridge can be thrown in to make something beautiful. Change the ingredients around to suit your tastes. I have made a spicy Mexican styled one with capsicum base, smoked paprika and chilli. Another favourite is the Italian themed baked eggs: basil, oregano, tomato paste, garlic, eggs and parmesan cheese. Try and stick with flavour themes to get the best end result.